This sale is for VIB and VIB Rouge members only. You need to present coupon to get 20% off in-stores.You can use these codes and shop in-stores multiple times from November 6th to November 10th. However, the coupon that you give to a friend (non-VIB) can only be used only once. For Canada, you should be receiving these coupons through email and as for United States, you should be receiving them by mail. If you haven't received the coupon through email, then log on to your Sephora account. Go on BEAUTY INSIDER (top of page) and you should be able to see it there. VIB Rouge Status is earned by spending $1,000 on purchases (before taxes) in a calendar year (requalification is required the following year). Click here for more information on VIB Rouge. UPDATE: Click here to read my blog post on the event. 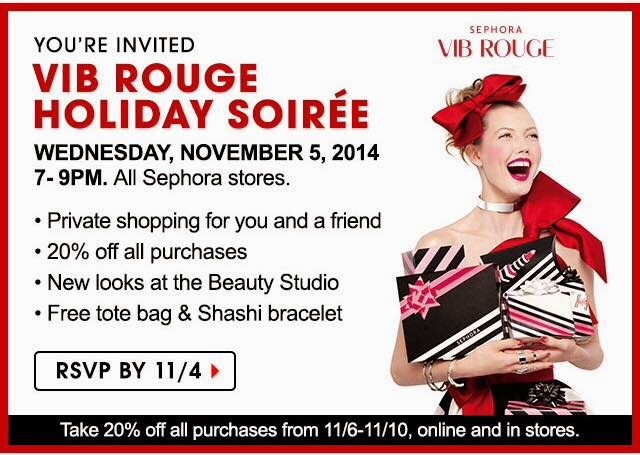 There's a closed-door event on November 5th, where VIB Rouge members get 20% off all purchases as well as a free tote bag & shashi bracelet. Each VIB Rouge member can bring a friend who will also get 20% off all purchases as long as he/she is a beauty insider. RSVP: You have to reserve by November 4th. Click here to reserve. Is this your first VIB Rouge event and not sure what to expect? Click here to check out my blog post on last event, which was in August 2014. 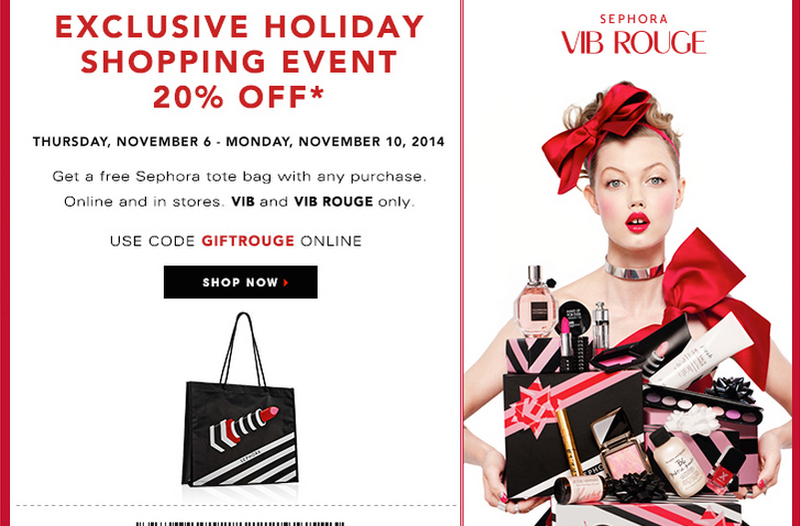 Unfortunately, the sale if for VIB/VIB Rouge. 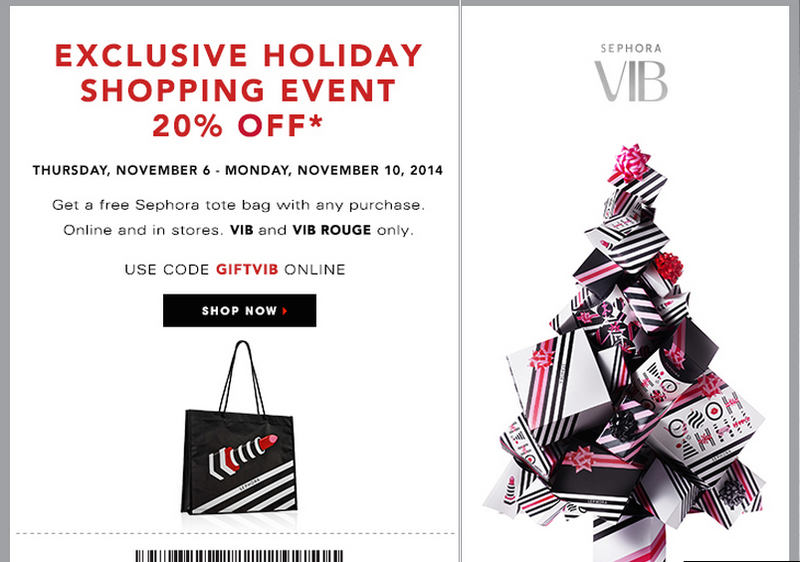 However, VIB/VIB Rouge members do have a coupon that they can give to non-VIBs, so you can definitely ask around. Whether you're looking for gifts or palettes/value sets for yourself, I've listed some of my picks below. I don't own most of them nor am I going to buy them during the sale but I've seen many good reviews on them. I'm sure many of you just like myself have started making a list of things to buy during the sale. Below are some of the products that I would recommend getting. MAKE UP FOR EVER HD Invisible Cover Foundation - $49 CAD ($42 USD): This is my favorite concealer! It's very photo-friendly, so I like to use this when I will take a lot of pictures. 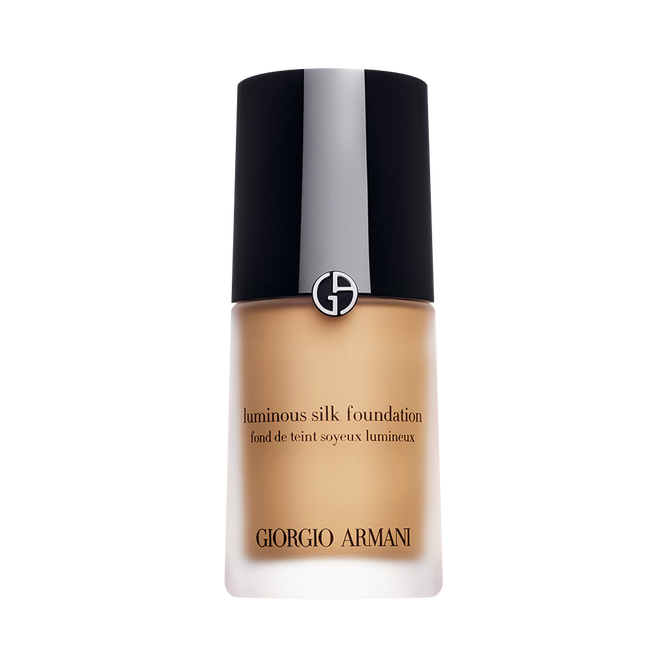 It's so lightweight and has a dewy finish, which I love! I do have to set my T-zone with powder though because that's where I normally get oily. That's something to keep in mind if you have combination/oily skin. NARS Radiant Creamy Concealer - $35 CAD ($29 USD): It's so creamy and blends it easily. I mainly use this to hightlight. I haven't noticed it creasing on me but I do set it with powder. BECCA Shimmering Skin Perfector™ Pressed Opal 0.28 oz - $46 CAD ($38 USD): I haven't used this highlighter but so many people rave about it, so I'm planning on getting during the sale. It does come in 4 other shades, so I'd suggest you swatch in-store. Too Faced Chocolate Soleil Medium/Deep Matte Bronzer Chocolate 0.35 oz - $38 CAD ($30 USD): I love this bronzer!! It's matte and looks natural! It's currently my favorite bronzer! Too Faced Bronzer Wardrobe - $28 CAD ($22 USD): If you'd like to try the bronzer out, then I'd recommend getting this sampler set including 4 deluxe-size bronzers and Teddy Bear Hair Flatbuki Brush. Anastasia Beverly Hills Tamanna Palette : This palette without sale is a great value in my opinion. I love it! Click here for my review. Urban Decay Palettes: I love Urban Decay palettes! Although I do get some fallout using some of their eyeshadows, I still love them because they last so long and they're quite pigmented. Naked Basics Palettes - $34 CAD ($29 USD): I have the Urban Decay Naked Basics Palette and I use it a lot. It's great to create everyday look and you can easily carry it around. Great for travel! They recently launched their second one: Urban Decay Naked2 Basics. Naked Palettes - $64 CAD ($54 USD): I have Urban Decay Naked2 and I'd love to own all of them but they are pricey. I'd recommend getting the one with the shades that are more appealing to you. Urban Decay Electric Pressed Pigment Palette - $58 CAD ($49 USD): I love the shades in this palette! They're so beautiful and vibrant! MAKE UP FOR EVER Artist Shadow - $24 CAD ($21 USD): I've heard nothing but good things on these eyeshadows! There are about 209 colors to choose from and if you usually get a discount if you create a custom palette of two or three eyeshadows. I'm not planning on buying these during the sale but I'd definitely try them in the future. I love that they have palettes! MAKE UP FOR EVER Artist Palette - $48 CAD ($42 USD): This first one has 8 shades (0.03 oz each). MAKE UP FOR EVER Studio Case - $68.50 CAD ($59.50 USD): This palette comes with 12 shades (0.024 oz each) and full size artist liner. Kat Von D Tattoo Liner Trooper 0.02 oz - $23 CAD ($18 USD) : This liquid eyeliner is great to create thin lines! I love using this as a daytime liner! Bite Beauty Agave Lip Mask 0.52 oz - $30 CAD ($26 USD): I love this stuff! It's so moisturizing! If you apply this on your dried lips, you will feel an instant relief! It's great for winter! A little goes goes a long way. I've been using it almost every night for the past few months and I still haven't finished the tube. Bite Beauty Agave Lip Mask Champagne Champagne Pearl 0.52 oz - $30 CAD ($26 USD) : This is relatively new. I read reviews and most people say the packaging is much better than the other one and there is a shimmer to it. I'll most likely try it out once I'm done with the other one. Beautyblender - $26 CAD ($19.95 USD): I absolutely love my beautyblender! Click here to read my full review on it. I'd really recommend buying the solid cleanser with it. It does a great job and I find it leaves less stain. They currently have a set of beautyblender and solid cleanser for $26 CAD ($19.95 USD). Clarisonic Skin Cleansing System: I got this during Chic Week Sale and I do like it. My skin does feel more clean and I got fewer breakouts. Click here to read my first impression on it. Josie Maran 100 percent Pure Argan Oil: It's very moisturizing but sadly it broke me out. That's why I stopped using it on my face. However, if you don't have acne-prone skin then I'd recommend trying it especially if you have dry skin. I still love using it on my nails! Josie Maran Argan Skincare Ritual Set - $26 CAD ($19.95 USD): If ever you'd like to try out Josie Maran skin care products, then I'd recommend trying this set. It comes with the argan oil, daily moisturizer (spf 47) and cleansing oil. I don't really like the cleanser but I like the moisturizer with sunscreen. I'm still not sure if it breaks me out though.